Neben einer Mindestmietzeit von 28 Tagen können Sie die beengten Ferienwohnungen und Hotels vergessen. Hinweis: Freunde und Familie bleiben frei, keine Vermietung erforderlich. Verwenden Sie einfach den Kalender hier, um den Zeitplan des Hauses für die gewünschten Termine anzuzeigen. Dieses Haus hat auch kürzlich komplett renoviert und wird nun für die selektive Nichtrauchervermietung angeboten. Genießen Sie einen 500 + Quadratfuß-Entertainment-Bereich vollständig abgeschirmt und getrennt von den Wohnräumen, zusammen mit einer privaten Community Strand und Dock nur wenige Schritte von der Haustür und ruhiger Lage, so dass Sie die Meeresbrise in der Nacht mit offenem Fenster genießen können. Die gesamte Einrichtung und Ausstattung sind neu und exquisit. Ruhig und dennoch nah an schwülen tolle Restaurants, größeren Geschäften, Kinos und Sehenswürdigkeiten. Der Standort liegt auch direkt in der Mitte des Fischer-Hauptstadt der Welt! Wenn die Fischerei ist nicht deine Tasche, Schnorcheln genießen Sie die Florida Riff, nur wenige Minuten von John Pennekamp Park, Dolphin Cove und Delphine Plus (wo Sie mit Delfinen schwimmen können), Theater of the Sea, die Florida Keys Wild Bird Center, und Mehr. Nach einem langen Tag, lehnen Sie sich zurück und genießen Sie besten Sonnenuntergänge der Welt !! Lazy R II was perfect for our family's recent vacation. It is conveniently located on Key Largo and the house itself is fantastic. 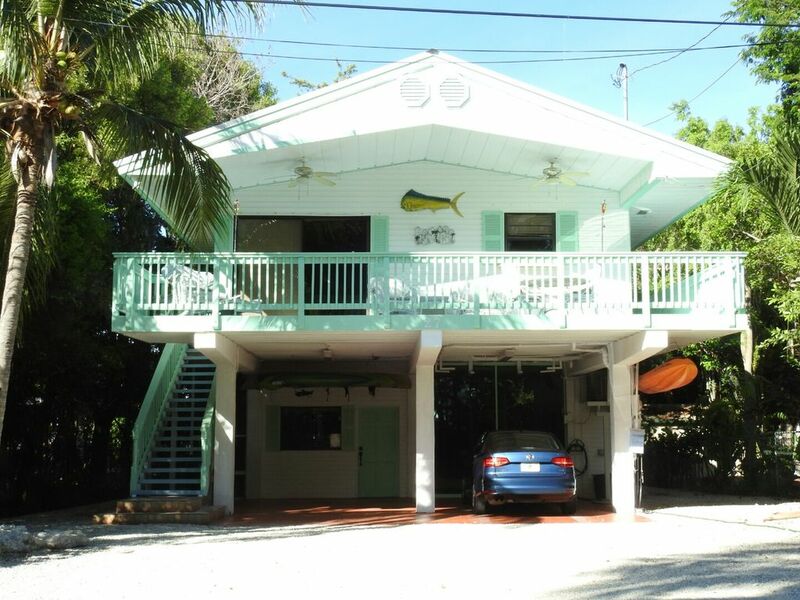 If you are looking for a laid back Key's vacation, you should definitely book this property! This home was everything we look for in a vacation home. Comfortable, clean, quiet, and convenient. Sitting outside on the deck for meals or for evening wind-down in February is priceless for a Wisconsinite! There was everything one needed to be comfortable, and the private beach and boat launch were an excellent resource for those launching boats or the provided kayaks. We are so glad you had a great time. Come back and see us soon!! Great location-charming clean house near the water-sunshine-who could ask for anything else? Loved every minute at this charming house in the keys. Nothing fancy-but clean and simple. Most everything you would need is there. Really enjoyed the private beach area went there every day. The best part of the house for us was the kayaks never went kayaking before it was so relaxing and surreal being on that wide open turquoise water. We went out just about every day! Hope to visit again soon! Comfortable older home, has everything you need. Neat and clean, convenient location, quiet development neighborhood, comfortable bed, great balcony porch, and stocked fairly well. The home is an older place, as is the rest of the community, and is a little tired and worn in places. But if you're looking for fine china and everything in new condition, stay at the Hilton. A nice sandy beach only 200 yards away. Kayaks available to use, but you have to pull them on rollers to the beach. All in all, a great stay, and we would certainly stay again when in the area. Not sure why this warranted a 4 star instead of 5. Our home is up to date, clean AND affordable. All homes in the Keys are “ older” meaning built in the ‘80’s or many - earlier. The diversity is a large part of the Keys charm. The Florida Keys combine nostalgia with history, a host of activities and a laid BACK atmosphere. That is unless you can afford to pay $1,500 plus per week. Anyone with familiarity in the keys has rated us a 5. If there were any issues we are always available to attend to them. There were none. Oh well, some folks are perhaps better suited to South Beach. Couldn't possibly give higher marks to this lovely residence, its owners or the people who maintain it. Served as a perfect base of operations for some SCUBA work my organization and I were doing in the Florida Keys this December. Perfectly located in a quiet neighborhood of Key Largo, just a stone's throw from the main highway, it afforded us both convenience and a remarkably quiet place to unwind each day. The accommodations were spotless and the wrap-around deck adds just enough luxury to make you feel like you're on vacation, even when you're not. Having the ability to prepare meals each night in the perfectly appointed kitchen and laundry whenever we needed to made our stay all the more enjoyable. I will definitely be returning. A great guest working to preserve the Keys delicate coral environments. I’m glad our home could help those extraordinary efforts in some way!! All fees and taxes are included in the lease amount quoted. There are no other lease charges. There is a fully refundable $250.00 security/damage deposit required to hold the timeframe requested which will be returned within a week or as soon as we get the cleanup accomplished after your stay.